Four Britons formerly held in US custody at Guantanamo Bay have been questioned by UK anti-terrorism officers and freed without charge in Britain. Moazzam Begg, from Birmingham, and Martin Mubanga, Richard Belmar and Feroz Abbasi, from London, were returned to Britain on 25 January after being detained in Cuba for nearly three years. US authorities have not brought charges against any of the Britons. Five other British nationals being held in Guantanamo were released in March 2004. Born in Uganda, he moved to Britain with his family when he was eight. The family based itself in Croydon, where Mr Abbasi attended Edenham High School. 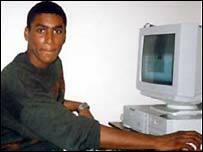 After A-levels at the nearby John Ruskin college, he took a two-year computing course at Nescot College in Epsom. According to reports he dropped out of this course to go travelling in Europe. His mother said he converted to Islam after a mugging. He became more fervent, and his family last saw him in 2000, as he was leaving for Afghanistan. He was reportedly detained by US forces in December 2001, in Kunduz in the north of the country. In November 2002 the British Court of Appeal said it found his detention in Cuba "legally objectionable", but stopped short of forcing the government to intervene on his behalf. His mother Zumrati Juma has said she is worried for his mental welfare and has not heard from him since late 2003. Ms Juma, a nurse from Croydon, said he was just one of a number of idealistic young Muslims caught in the wrong place at the wrong time. Mr Belmar was held by Pakistani authorities before being moved to Cuba. Said by his family to have converted to Islam, he travelled to Pakistan before the attacks of 11 September 2001. It is believed he attended a Catholic school in north London, and converted to Islam in his teens, after his elder brother. His family say he was a troublesome teenager, but after becoming a Muslim was polite and respectful. Reportedly a former Royal Mail worker, he worshipped at Regent's Park mosque, close to his home in Maida Vale, London. Richard Belmar wrote: "I hope everyone will believe in me." The US authorities claim he was captured at an al-Qaeda safe house in Pakistan. His detention seems to have started in February 2002. His Catholic father Joseph Belmar told the Sunday Mirror he believed the authorities were trying to paint his son as a terrorist. "They have said he was in Afghanistan in 1998 studying chemicals at the terrorists' base but I know he was in London," Mr Belmar told the paper. The Sunday Mirror reported Richard Belmar wrote a letter from Guantanamo Bay saying: "I'm still alive. I have done nothing wrong against the US or Britain and I hope everyone will believe in me. "I love you all and hope you will forgive me." 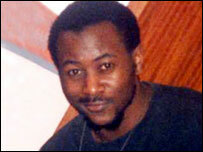 The father-of-four from the Sparkbrook area was detained by the CIA in Pakistan in February 2002. He was moved to Cuba in February 2003. Mr Begg's father, Azmat Begg, has run a high-profile campaign for his son's release and travelled to the US in a bid to free him. His family have been refused permission to visit, although they have been able to write. Azmat Begg says he has not been told why his son was being detained. 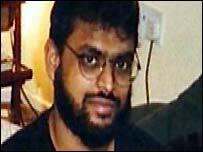 Moazzam Begg was a law student and ran an Islamic book and video store in Birmingham. Mr Begg said he had urged his son to move to Kabul with his wife and children to fulfil an ambition to build a school and help improve water supplies. Following the American bombings, the family then fled the Afghan capital for Pakistan, where the arrest took place. In a letter sent from Guantanamo Bay, he said he had been tortured, threatened with death and kept in solitary confinement since early 2003. Interviews "were conducted in an environment of generated fear, resonant with terrifying screams of fellow detainees facing similar methods," he wrote. "In this atmosphere of severe antipathy toward detainees was the compounded use of racially and religiously prejudiced taunts." Mr Mubanga has joint Zambian and British nationality. His family moved to the UK in the 1970s. He is a former motorcycle courier and was raised as a Catholic before converting to Islam in his 20s. He went to Pakistan in October 2000 to attend an Islamic school and visit friends. According to the Daily Telegraph, after the fighting in Afghanistan in 2001 Mr Mubanga told his family he had lost his British passport, but as a dual British and Zambian citizen used his other passport to travel from Pakistan to the Zambian capital, Lusaka, to stay with his sister. Not long after his arrival there he told his parents he had heard news reports that someone with his name had been arrested in Afghanistan and he was concerned an Islamic extremist was using his missing British passport. He was held in Zambia, along with his sister, before the authorities there placed him in the custody of the Americans. His sister was released. According to the Guardian newspaper, Mr Mubanga alleges torture during his detention at Guantanamo Bay. 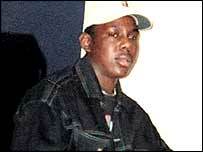 In July 2004 he made two allegations of ill-treatment by the Americans during a visit from a Foreign Office official. He says an interrogator stood on his hair, he was exposed to extreme temperatures and he was forced to clean up his own urine after he wet himself while shackled.